EKT has undertaken the co-ordination of actions for Open Science policy and electronic publishing. OpenAIRE Advance, which continues the mission of OpenAIRE to support Open Science and Open Access to European research results, commenced 1st January 2018. It aims to further strengthen existing infrastructure based on National Open Access Desks/NOADs and technical services, making OpenAIRE a trusted e-infrastructure within the European Open Science Cloud (EOSC). The goal of the project is the development and support of e-infrastructures to meet the needs of the scientific community in terms of access to, preservation and processing of digital material for research. At the same time, it aims to strengthen interoperability of digital infrastructures for scientific resources (data, publications etc) for research on European and global levels. In this new phase, the NOADs (the backbone of OpenAIRE) will be further strengthened through the development of their capabilities, making them the main actors in a national Open Science ecosystem. This will be achieved by developing skills through task groups in thematic areas ( policies, research data management RDM, legal issues, text data mining TDM) and extending the Helpdesk by adding with support and training toolkits. On a technical level, the project focuses on the operation of the technical TRL8/9 services and radically upgrades them through the optimisation of performance and functionality, as well as the adoption of key performance indicators (KPIs). The collaboration with Elixir-Gr, DARIAH-DE, EPOS-IT, will build bridges via an ‘Open Science-as a-service’ approach. Reaching out to a wide network of schools will lay the foundations for citizen scientists to benefit from Open Science, while the programme for open innovation will bring OpenAIRE closer to the industrial sector. OpenAIRE is expected to strengthen its international role through the widening of collaborations around the world including, Latin America, Japan, Canada and Africa. The National Documentation Centre (EKT) has undertaken the co-ordination of actions for Open Science policy and electronic publishing. EKT will head work groups aiming to support member states in the adoption of Open Science/Open Access policies which are in alignment with those of Europe, through actions such as shaping policy models, policy toolkits and advice for NOADs. To achieve the above, EKT will develop the expertise it has already gained from the co-ordination of and participation in European projects such as MedOAnet, RECODE and PASTEUR40A, which focused on Open Access policy issues. In addition, it will first explore the degree of interoperability of the e-publishing infrastructure with OpenAIRE and subsequently work on proposals to improve the technical requirements and metadata. The National Capodistrian University of Athens is the co-ordinator for the 48 organisations from all over Europe participating in the OpenAIRE project. Greek participants include EKT, the ‘Athena’ Research Centre and the Ellinogermaniki Agogi. 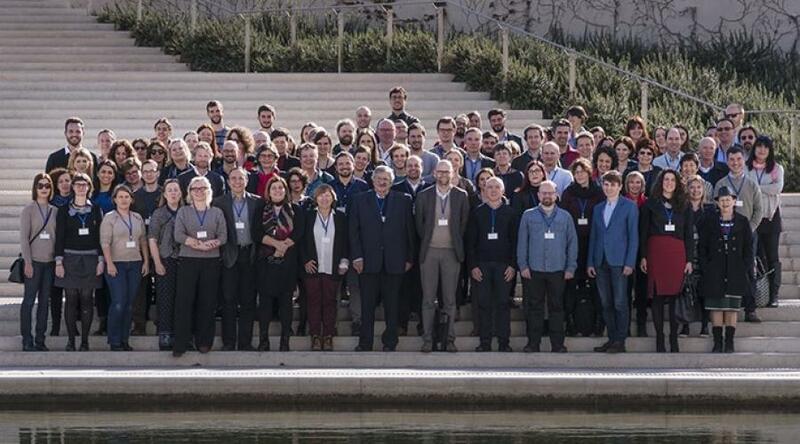 The official launch of the project took place in Athens, 17-19 January 2018, and was attended by all project partners.